Basically a linear regulator comprises input, output, and GND pins. In linear regulators with adjustable output, a feedback pin (Figure 1) is added that is fed back the output voltage. Figure 2 provides a schematic view of the internal circuit of a linear regulator. Basically the internal circuit is composed of an error amplifier (op amp for error detection), a reference voltage source, and an output transistor. Although in the figure the output transistor is represented as a Pch MOSFET, Nch MOSFETs, as well as bipolar PNP and NPN transistors, are also used. The operation of a linear regulator is completely analog. Its circuit is a feedback loop circuit which is one of the basic control circuits using an operational amplifier. Even when the input or load fluctuates and the output voltage begins to change, the error amplifier continuously monitors and compares the feedback voltage from the output of regulator with the reference voltage, regulates the power transistor so that the difference is zero, and maintains the VO value constant. This is regulation based on feedback loop control. 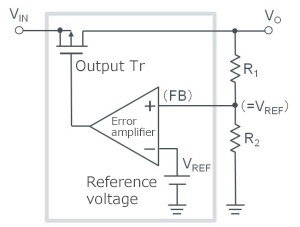 ・The regulation of linear regulator output is based on feedback loop control using an error amplifier.